Runners from area high schools and colleges competed at the Utah Olympic Oval March 9 in the first annual GoldenSprint Challenge Invitational track and field sprint event. Sprinters competed in 60 meter race and/or a 200 meter race. The meet, sanctioned by the USA Track and Field Association, is the dream of Akwasi Frimpong, 2012 Dutch Olympic hopeful and UVU student. He hopes to inspire more youth to participate in sports – especially track and field. To kick off this goal, he partnered with the Utah Olympic Oval to put together this meet, and future plans are to make this an annual international meet to promote local and international athletes. The name of the meet, “GoldenSprint,” is one of Frimpong’s nicknames he earned when racing as an illegal African immigrant in the Netherlands. His Dutch coaches gave him golden track shoes after his first Dutch National win. The fastest men’s and women’s sprinters at the GoldenSprint Challenge followed Frimpong’s footsteps and took home the first GoldenSprint Spikes Trophies. Sarah Palmer, Dak Kleven, Tiera Hansen and Javier Coles gained this coveted honor. Frimpong received the award for being the best male athlete, but gave it away to the runner up, Javier Coles. The GoldenSprint Challenge Invitational was a great success and Frimpong is fielding calls from coaches, athletes and sponsors to be involved next year. Frimpong said he and his team would not have been able to put this event together without the following partners and sponsors: Utah Olympic Oval, Utah USATF Officials, Bonzy Design, Neways Inc., Alleviate, Acai Action, McGee’s Stamp and Trophy, Runner’s Corner and Carrabba’s Italian Grill. The Proceeds of the event will be donated this week to Special Olympics Utah. 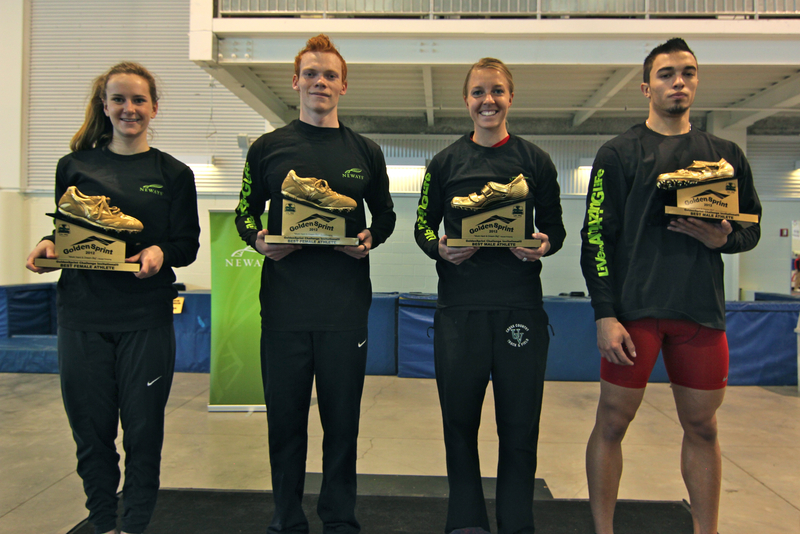 2012 GoldenSprint Challenge Invitational best male and female athletes. Sarah Palmer, Dak Kleven, Tiera Hansen, and Javier Coles. Results and other information concerning the annual GoldenSprint Challenge Invitational can be obtained by emailing goldensprintchallenge@gmail.com or visiting our website www.goldensprintchallenge.com.